Note: This is NOT a GPSMAP 64st. This listing is for a GPSMAP 64 only. 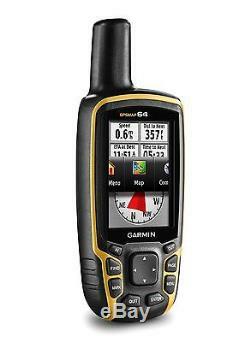 Rugged, Full-featured Handheld with GPS and GLONASS Combined. 2.6 sunlight-readable color screen. High-sensitivity GPS and GLONASS receiver with quad helix antenna. 4 GB of internal memory and a microSD card slot. GPSMAP 64 features a 2.6 sunlight-readable color screen that supports BirdsEye Satellite Imagery (subscription required) and Garmin Custom Maps. 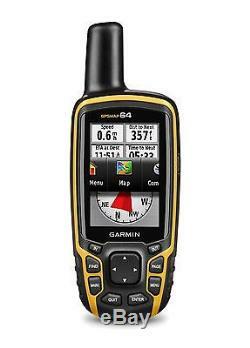 Rugged and waterproof, GPSMAP 64 uses a quad helix antenna for superior reception. GPSMAP 64 comes with a built-in worldwide basemap with shaded relief so you can navigate anywhere with ease. With photo navigation, you can download geotagged pictures from the Internet and navigate to them. With its quad helix antenna and high-sensitivity, GPS and GLONASS, receiver, GPSMAP 64 locates your position quickly and precisely and maintains its location even in heavy cover and deep canyons. The advantage is clear whether youre in deep woods or just near tall buildings and trees, you can count on GPSMAP 64 to help you find your way when you need it the most. Adding more maps to GPSMAP 64 is easy with our array of detailed topographic, marine and road maps. With 4 GB of onboard memory and microSD card slot, you can conveniently download TOPO 24K and 100K maps and hit the trail, plug in BlueChart® g2 preloaded cards for a great day on the water or City Navigator NT® map data for turn-by-turn routing on roads (see maps tab for compatibility). GPSMAP 64 also supports BirdsEye Satellite Imagery (subscription required) that lets you load satellite images onto your device and integrate them with your maps. In addition, the 64 is compatible with Custom Maps, a map format that allows you to transform paper and electronic maps easily into downloadable maps for your device, for free. GPSMAP 64 supports paperless geocaching with 250,000 preloaded caches with hints and descriptions from Geocaching. Com, and has a 16-hour battery life. By going paperless, you're not only helping the environment, but also improving efficiency. GPSMAP 64 stores and displays key information, including location, terrain, difficulty, hints and descriptions, which means theres no more manually entering coordinates and paper printouts! Slim and lightweight, 64 is the perfect companion for all your outdoor pursuits. Take charge of your next adventure with BaseCamp, software that lets you view and organize maps, waypoints, routes and tracks. This free trip-planning software even allows you to create Garmin Adventures that you can share with friends, family or fellow explorers. BaseCamp displays topographic map data in 2-D or 3-D on your computer screen, including contour lines and elevation profiles. It also can transfer an unlimited amount of satellite images to your device when paired with a BirdsEye Satellite Imagery subscription. What's Included In The Box? 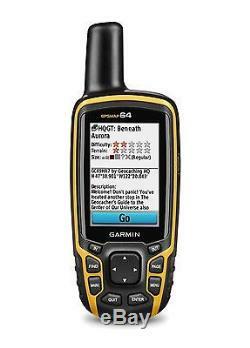 The Garmin GPSMAP 64 ships with the following items included. Here is a list of. Along with a few user tips. Unit dimensions, WxHxD 2.4" x 6.3" x 1.4 (6.1 x 16.0 x 3.6 cm). Display size, WxH 1.43" x 2.15" (3.6 x 5.5 cm); 2.6 diag (6.6 cm). Display resolution, WxH 160 x 240 pixels. Display type transflective, 65-K color TFT. Weight 9.2 oz (260.1 g) with batteries. Battery 2 AA batteries (not included); NiMH or Lithium recommended. Interface USB and NMEA 0183 compatible. Ability to add maps Yes. Accepts data cards microSD card (not included). Track log 10,000 points, 200 saved tracks. Automatic routing (turn by turn routing on roads) Yes (with optional mapping for detailed roads). Photo navigation (navigate to geotagged photos) Yes. Sun and moon information Yes. Tide tables Yes (with optional Bluechart). Custom POIs (ability to add additional points of interest) Yes. Unit-to-unit transfer (shares data wirelessly with similar units) No. Garmin Connect compatible (online community where you analyze, categorize and share data) Yes. 2.4 x 6.3 x 1.4in (6.1 x 16.0 x 3.6 cm). 1.43 x 2.15 inches (3.6 x 5.5 cm); 2.6in diag (6.6 cm). 9.2 oz (260.1 g) with batteries. NIMH, Lithium or 2 AA batteries; Batteries not included. Bluechart g2 Vision Map Compatible. Garmin Connect compatible (online community where you analyze, categorize and share data). Turn right in 500 ft. Turn right ON ELM STREET in 500 ft.
Route avoidance avoid highways, tolls etc. Custom POIs (ability to add additional points of interest). Hands-free calling with Bluetooth® wireless technology. World travel clock, currency & measurement converter, calculator. Qwerty or ABC keyboard (choose keyboard layout). Data Services with Bluetooth Technology. TrafficTrends (calculates routes from predicted traffic flow). MyTrends (predicts routes from user's navigation behavior). Services (accurate real-time travel data). Multimode (switches modes to drive, hike, bike or boat). Garmin Garage vehicles compatible (download car icons). Garmin Garage voices compatible (download custom voices). 10,000 points, 200 saved tracks. Unit-to-unit transfer (shares data wirelessly with similar units). Photo navigation (navigate to geotagged photos). Supports AIS (tracks target ships' position). Supports DSC (displays position data from DSC capable VHF radio). XM WX Weather & Radio for U.
A-scope real time display of fish passing through transducer beam. Whiteline (indicates hard or soft bottom). 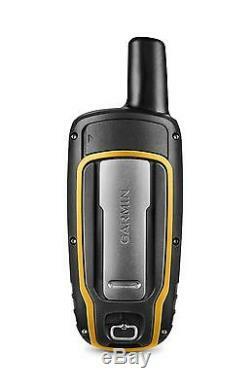 The item "Garmin GPSMAP 64 Worldwide Handheld GPS Navigator 010-01199-00" is in sale since Friday, June 5, 2015. This item is in the category "Consumer Electronics\Vehicle Electronics & GPS\GPS Units". The seller is "gpscity" and is located in Las Vegas, Nevada. This item can be shipped worldwide.